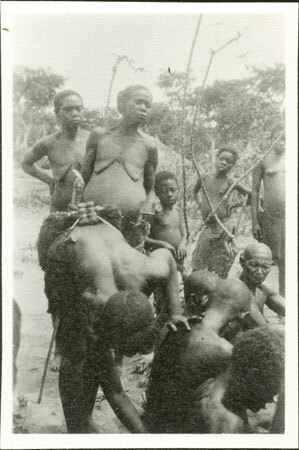 A woman anointing shaven-headed widows (dekurugbo) with termite oil by a woman wearing a grass waist covering, at the termination of the mourning period when a feast is held. After a husband's death widows would have been expected to marry either his brother or another close male relative (levirate). Morton, Chris. "Ritual anointing of Zande widows" Southern Sudan Project (in development). 03 Jan. 2006. Pitt Rivers Museum. <http://southernsudan.prm.ox.ac.uk/details/1998.341.435.2/>.